Darwin, California, near Death Valley, wants broadband -- Count your lucky stars you don't have 28.8k dialup! IMAGINE being suddenly transported to the idyllic quiet of the tiny town of Darwin, California — surrounded by towering mountains and majestic high-desert scenery. Then much to the transportee's steam-whistle screaming horror, he/she is forced to use dialup for an internet connection, which in Darwin theoretically is an abysmal 28.8k, but in reality is an even slower 24.6 or 26.4k. And dudes and dude-ettes, youse have no clue how slow this is. Watching shellac dry is 30 times faster than an internet dialup connection in Darwin, California. IMAGINE the dumbfounded new resident when he tries to look at the newest Home Depot flyer, only to discover that it takes SEVEN EFFING MINUTES to appear onscreen .... And that's just the first page. Reading a PDF-based ad takes a few relaxing minutes anywhere else. However, outmoded ARCHAIC dial-up in Darwin transforms a fun look-see to a teeth-gnashing HELL of 60-minutes duration! And just to look at crappy overpriced Home Depot cardboard garage doors and Chinese-made power tools that break in under a year. You Tube or internet radio ..... Just forget it. Digging to the Earth's core with a plastic spoon is easier. 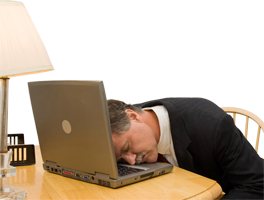 Downloading a patch from Microsoft can take all night long! Then halfway through the download, the carrier drops — because Darwin's phone lines leave a lot to be desired — and you lucky devil; you get to start all over again! Oh, and you want to talk to your family and friends because you live in a remote area? Good thing you have a phone, right? Wrong! You obviously have never been online in Darwin. You miss all your calls because you're tying up the phone because you're online. Everyone gets so sick of dialing you and getting a busy signal that they just stop calling. In desperation, you decide to buy some rope on ebay to hang yourself because you can't take the slow internet connection any more, but Paypal times out when you try to pay. You try and try to pay, but the browser load times-out every time. 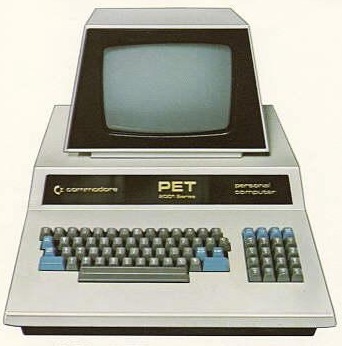 Fire up your 1971 Commodore PET and feel the speed of Darwin's FLAMING 28.8 connection speed. Paypal cancels your account because you won't pay for your auction items, no matter how many times you call and tell them that your dial-up connection is too slow to pay. "This is America. How could anyone have an internet connection that slow?" they laugh. Soon all your credit cards are cancelled because of the Paypal debacle. Your bank account is frozen because it will take Paypal six to eight months to ascertain your true debt. You have no money to pay for food. They shut off the water and utilities. You have plenty of money in the bank, but the account is frozen. The bank will unfreeze your account if you sign some paperwork in person, but you have no money to pay for gas for the 180-mile trip to Bishop, California and the nearest bank! You wander the desert, delirious from lack of food. Your house has been foreclosed for mortgage nonpayment. Inyo County Search and Rescue doesn't search and rescue because no one told them you were missing. You lost all your friends because you were always online, and they got sick of calling, remember? With buzzards circling, you collapse, die. 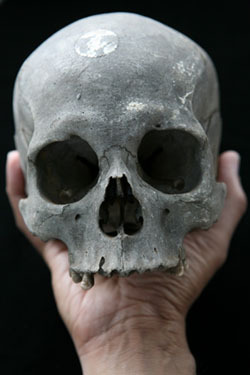 Your bleached skull is found by Bobby "Shpilkis" Langer of Costa Mesa Boy Scout Troop 62, six years later. He keeps it on a shelf in his room for a few days, but then he thinks it "smells funny." He throws it — and your attached dental work — in his trash can, the one with the Crystal Cathedral nativity scene on it. There goes any hope that your remains will ever be identified. Paypal finally releases your bank account, six years after it was frozen, blaming an administrative error for the delay. All e-mails to your address are returned as undeliverable. from ATVs! WOW!! What fun!! The Randy Ryans, a born-again Shintu family from Fontana, who bought your Darwin house at tax sale, throw away letters sent to you from the bank. "Who's this guy? Who cares? Let's rev up our muffler-less ATVs, and go shoot at Joshua trees and small rabbits with shotguns and large-bore semi-automatic assault rifles!" And it all started with Darwin's slow dialup internet connection!